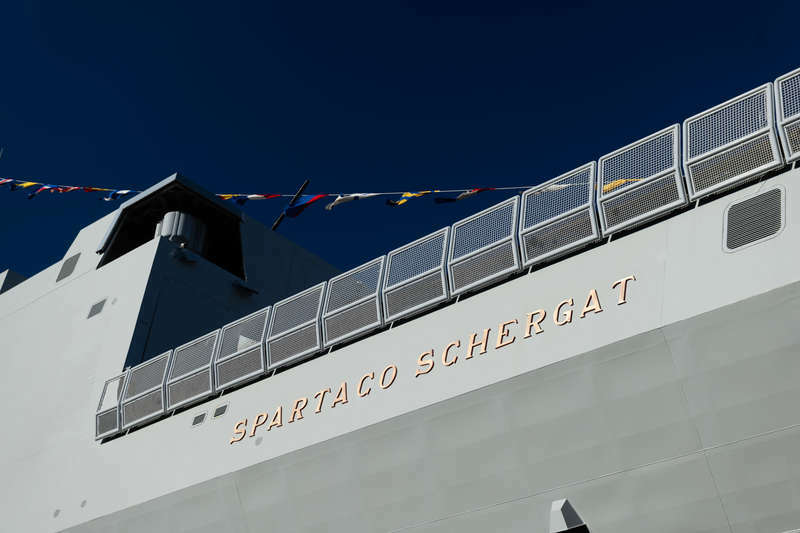 The launching ceremony of the “Spartaco Schergat” frigate, the ninth of a series of 10 FREMM vessels – Multi Mission European Frigates, took place today at the integrated shipyard of Riva Trigoso (Genoa). The 10 FREMM vessels have been commissioned to Fincantieri by the Italian Navy within the framework of an Italo-French cooperation program under the coordination of OCCAR (Organisation Conjointe de Cooperation sur l’Armement, the international organization for cooperation on arms).Godmother of the ceremony was Anna Rosa Aonzo Grillo, daughter of the Golden Medal for Military Value, Giuseppe Aonzo. The vessels “Carlo Bergamini” and “Virginio Fasan” have been delivered in 2013, the “Carlo Margottini” in 2014, the “Carabiniere” in 2015, the “Alpino” in 2016, the “Luigi Rizzo” in 2017, and the “Federico Martinengo” in 2018. The Italian program has been fully implemented with the option exercised in April 2015, regarding the construction of the ninth and tenth vessel, whose delivery is scheduled after 2020. Orizzonte Sistemi Navali (51% Fincantieri, 49% Leonardo) acts as prime-contractor for Italy in the initiative, while Armaris (Naval Group + Thales) is prime contractor for France. He was born in Koper on July 12, 1920. Voluntary in the Royal Italian Navy starting from March 1940, and part of the “Frogmen” category, after having attended the course held at the CREM School of San Bartolomeo (La Spezia) where he got the diver license, he entered in the 1^ Squadron MAS (called 10^ MAS Fleet in June 1941) as operator of special assault vehicles. He took part in the Gibraltar forcing missions in May and September 1941 and in the quest of Alexandria at the dawn of December 19 of the same year when, as 2nd operator of the “maiale” underwater assault vehicle led by Captain Antonio Marceglia (to whom the Fremm n. 8 is entitled), he placed the mine under the English battleship Queen Elizabeth, which sank in the port, due to the bursting of the charge, being unable to take part in the conflict a long time due to the damages sustained. He was captured and taken in the n. 321 English prison camp in Palestine, while in October 1944 he returned home participating in the War of Liberation in the Assault Vehicles Group. He retired in November 1945, becoming a member of the Role of Honour with the degree of Chief Petty. “Heroic fighter, loyal partner of his Officer, he shared the risks of a tenacious and dangerous training, following him in the most daring quests, inspired by the same fiery determination to succeed. He participated with him in an expedition of underwater assault vehicles, forcing one of the most powerful and defended enemy naval bases, with an action in which operational understanding and practical application brilliantly matched with the cold courage and self-sacrifice of men. After having covered several miles under water, overcoming difficulties and obstacles of any kind, he was a valid and faithful help to the Officer; he attacked the ship with firm skill, joining the fate of his Officer in captivity, constantly refusing to provide the enemy with any information; superb example of bravery when in action and possessing extraordinary moral qualities".